This was the last of a night of silent flicks TCM aired. It took me this long to get to it for no good reason. I’ve seen big chunks of this before, I especially remember the collapsing house sequence, but this would be my first complete viewing. Man, I love me some Buster Keaton! I watched STEAMBOAT BILL, JR. (1928) on 11.29.10. It was my first viewing of the film. WATCH THE WHOLE MOVIE HERE! So the story here is that Keaton is the long lost son of a steamboat operator, who’s steamboat is now obsolete. The two meet, and father instantly dislikes son. Son likes daughter of father’s business enemey. So daughter’s father dislikes Keaton too. Really (like with Chaplin) everyone is against Keaton except the girl, who sees something endearingly innocent in his bumbling. But all that is just dressing for a series of stunts and fun sequences. A scene where Keaton goes through dozens of hats before finding one he likes, only to have it blown into the river by a gust of wind is both hilarious, and a good piece of foreshadowing. The event of this film is the cyclone/hurricane scene, when all hell breaks loose and the town is being literally (and often unrealistically) blown to pieces. The creation of this scene is breathtaking, and the filming makes it all seem so real! It’s funny watching this film to see what the accepted movie gaffes used to be. Here a punch in the stomach instantly knocks a man out. Here a plank of wood needs only one end supported to hold weight. Here the front of a house can literally fall down. All of this would be silly and absurd, if it wasn’t so silly and absurd. I love every moment of it. The world of the film is never betrayed, as Keaton and Chaplin were both so smart in never doing. Is this as good as THE GENERAL? Maybe not. But it is just as watchable! 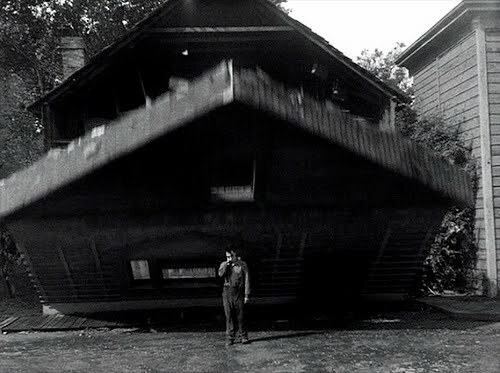 You have to give a bonus point for Keaton’s stunt work, especially that collapsing house scene which finds him perfectly placed where the window would fall. Had he mistimed that, he would have been killed. Just like in THE GENERAL, Keaton puts himself in harms way for our enjoyment! ~ by johnlink00 on November 29, 2010.